Not a whole lot of excitement will come in the 7-Day forecast. This time of year, that is not necessarily a bad thing. Today and Tonight: If we had to peg a day to have the most action and greatest rain coverage of the week, it would be Tuesday. About 60 percent of the area should pick up a shower or thunderstorm after high temperatures top out around 91 degrees. Some locations will see rain before lunchtime and therefore may not quite get that high. Winds will continue to be light and southeasterly keeping plenty of humidity in place. Overnight, activity will ease with low temperatures going into the mid 70s. Up Next: A surface high pressure system will remain parked over the Carolinas resulting in continued southeasterly wind flow across the Gulf and inland. This setup will provide ample moisture for scattered showers and thunderstorms to develop during the afternoons. Looking ahead to next weekend, the strongest signal is that the same late summer weather pattern will continue, meaning Sunday watch parties and Labor Day plans will be fine, just needing to dodge a passing shower or thunderstorm. Football is Back: For those making a trek to Dallas, the key weather feature will be heat. The early outlook for northeast Texas calls for dry conditions with highs in the upper 90s and lows in the mid 70s. Southern gets the party started one day early in Fort Worth and unfortunately that is a midday, outdoor game at TCU where temperatures could push triple digits. Rain is not expected to be an issue in northeast Texas either day. 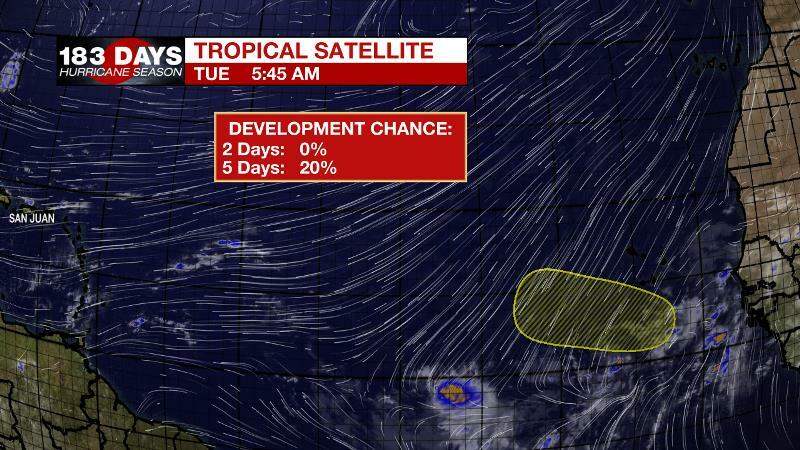 The Tropics: A wave moving off the African Coast will have a shot at some development near the Cabo Verde Islands over the weekend into next week. Right now, the National Hurricane Center assigns this region a 20 percent chance of formation. There are some signs that the basin may awaken as we near the peak of the season in Mid-September. Continue to check in for updates. An upper level high pressure is now centered over the Appalachian Mountains. This has opened the region to deeper Gulf moisture and minimal subsidence to inhibit convective development. The atmosphere is well saturated with precipitable water or available moisture around two inches and that is above average for the time of year. The combination of minimal subsidence and ample moisture throughout the atmosphere will create an environment conducive for scattered to numerous showers and thunderstorms to develop over the next several days. Storms will fade in the late afternoon and early evening as the sun sets. The upper level high pressure will gradually shift east and into the western Atlantic Ocean, and become anchored there through at least the rest of this week. 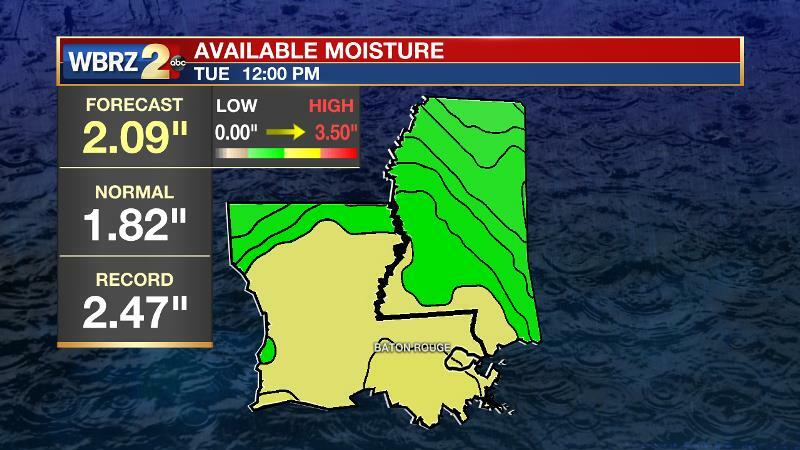 This should result in a relatively stagnant forecast with 40-60% coverage in measurable rain each day. In terms of temperatures, outside of storm influences, highs should be near normal each day. The Weather Prediction Center is highlighting a fast moving tropical disturbance crossing the northern Gulf Coast next weekend, which could serve to enhance showers and thunderstorms for a day or two.